We hit the town last night with the intent of scoping out Chelsea speakeasy newcomer Bathtub Gin, but when we arrived, it was reservation only. We started to walk home and as we were discussing what our replacement plan should be we walked by Salinas. I've been hearing great things about them since they opened in June, so we popped inside. We planned on hitting up Smorgasburg a few weeks ago as part of our glorious NYC Staycation, but after brunch at Pies N Thighs we were full for the whole day. Today we wouldn't make the same mistake twice, so headed off to Williamsburg with empty stomachs. We planned on starting our day with doughnuts from Dough, but they were a no show. OK, straight to luncheon foods it is. We couldn't help but notice this booth as soon as we walked in with its obviously fresh-baked, crusty rolls and tempting slab of pork. 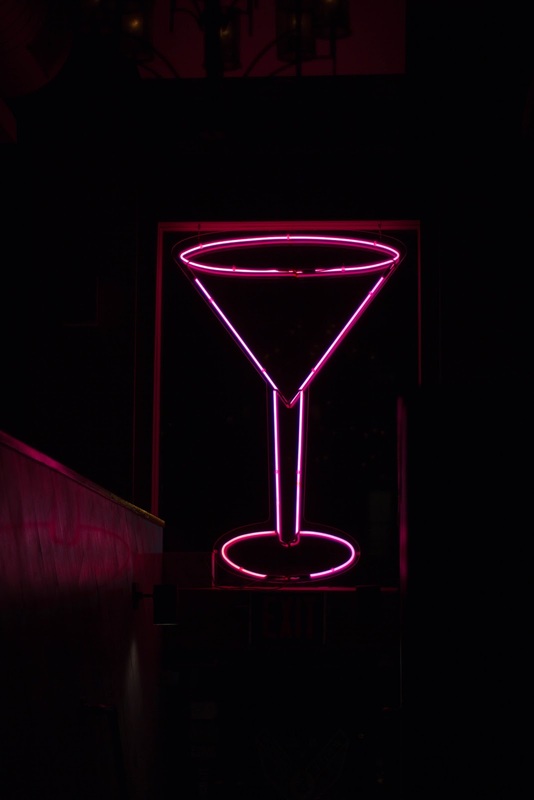 Look for the large pink neon martini glass at the corner of Church Street & White Street and make a beeline for the door. But don’t be fooled, there is so much more than just great cocktails waiting inside for you. Just to prove that I do occasionally spend some time in the kitchen myself, I whipped up a batch of Hungry Girl's Cincinnati Chili. It was a bit bland though, so I looked up a bunch of other recipes and kicked it up with some extra seasonings. Today we visit our neighbor Rub BBQ on 23rd St near 8th Ave to see what Chelsea has to offer in terms of barbecue. One of the first things I notice is their 'Sold Out' board (just to the right of the dude with the hoodie in the photo). I read on the back of the menu that they only make a certain amount of each of their dishes each day and that when they are gone, they're gone until they make the next batch the next day. I respect that. We've been trying to plan a dinner with another couple for some time now, so when we saw the Gilt City deal to Ciano, we jumped on it and set a date. I made the reservation on Open Table and then called them to tell them we would be using the voucher, so imagine my surprise when we arrived and told me she couldn't find my reservation. Since I had talked to someone a few days before I insisted that she check again. Oh! There it is, she forgot to go to the next page. Wow, OK.
We were led to an upstairs room, which was disappointingly not as nice as their main dining room (which was fairly empty at this point). Then they gave us menus and we excitedly started picking the appetizer and main dishes- we were very excited. A few minutes later the waiter came back and asked if we were using the Gilt City voucher- oh that's a different- much more restrictive- menu. Our hearts immediately sank, it was decidedly not as appetizing. There were two appetizers, two mains, and two dessert options so we ordered one of each to split. My new boss took our team for an outing to see the "Talk to Me: Design and the Communication between People and Objects" exhibit. (Our team is responsible for User Interaction Design at our company so it was very apropos.) We started our day out with lunch at Cafe 2 where most of us opted for the Soup & Bruschetta lunch which comes with a cup of soup, your choice of two bruschetta, and two cookies. What a perfect day-at-the-museum luncheon option! The soup of the day was tomato and I chose the Cured Tuna (with black olives & lemon) and Cauliflower (with gorgonzola, toasted walnuts, and honey) bruschetta. I enjoyed it all immensely and the chocolate chunk cookies made a delightful end to the meal. I owed my friend a dinner for her birthday and we wanted to go somewhere near Kips Bay where we were going to a movie afterwards, so we decided a trip to Koreatown was in order. I asked my friend for her recommendations and she went through a list of great restaurants, but her eyes lit up when she mentioned Hangawi, so I know that was the one. To end our anniversary date night, we headed over to Don't Tell Mama to enjoy their Piano Bar evening. When we got there the crowd was light, but over the next hour it got packed. It's obviously heavy on the show tunes (I mean, hello, Theatre District), but they did a good job mixing in some oldies too. The whole waitstaff gets in on the act, which is nice since it breaks up the monotony of the one man show. We decided to celebrate our Two Year Wedding Anniversary by redeeming our Thrillest Reward Dinner for Two at Ember Room. This tasting menu pitted Todd English's dishes against Chalermkittichai's. We were ready to be official judges and took our responsibility quite seriously. To end our Labor Day/Anniversary Staycation, we stopped by Todd English's CrossBar at The Limelight Marketplace to use a Thrillist Voucher. A lot of the articles I read when it initially opened criticized the over the top medieval theme, which is still evident in the major furnishings, but appears to have been toned down a little. I was also a little wary of the nose-to-tail heavy menu with a lot of items that we Newbie Foodies don't particularly enjoy (sweetbreads, bone marrow, etc). The menu we received was very different from the one I perused when they opened. Last week I had an early Doctor's appointment and was looking for a place to grab an iced coffee on my way to work. I'd heard of The Grey Dog's Coffee before and was going to pass right by it, so I stopped by. The instant I stepped in the door I felt like I had been transported to Austin. Part coffee shop, part brunch haven, part bar, it reminded me a lot of Austin Java Co. I knew I needed to bring The Mr by here for brunch, lunch, or happy hour immediately. After a trip to the American Museum of Natural History it made perfect sense (both geographically and thematically) to finally visit the famed Dinosaur BBQ joint in Harlem. We thought we were being clever by going at 4pm on a Sunday afternoon-not quite dinner, well past lunch- but were still facing an hour wait. We were way too hungry for that nonsense so turned into seat stalkers in the first-come, first-serve bar area. Our vigilance paid off and we ordered our beers (great selection!) and our meal. After a long day, we wanted a light meal and happened to be walking down 6th Avenue (or Avenue of the Americas if you will) so I suggested we stop in to Markt. Since we've moved to the city over a year and a half ago, I've been envisioning a romantic dinner over a pot of mussels and they have a great reputation. As part of our staycation weekend, we wanted to further explore all that Williamsburg has to offer. No conversation about fried chicken in NYC can come up without Pies 'N Thighs getting high praise. I wasn't sure what to expect, but wasn't too surprised when it turned out to be a small, bright, Williamsburgesque space. Since we are still clinging to summer, we got to sit in the back patio area, where we promptly ordered a Brewdriver and a Michelada. Apparently, a Brewdriver is a beer with orange juice. At first we were a bit worried, but after one sip we realized how much sense it makes. Think about how good a Shock Top is with a slice of orange and just dial that up a notch! The Michelada was pretty darn good too. It had been a while since we've had Korean Fried Chicken, so we decided it was time to use our Living Social voucher and visit the famous BonChon Chicken. When we arrived however, there was a sign on the door that they were no longer accepting the Living Social coupons. Ok, so that's annoying, but we weren't going to let that deter us. We walk in to a loud restaurant- to be clear it was late, so it wasn't the patrons who were loud, it was the largely projected music videos. Ok, that's interesting too, but hey, we could use a pop culture crash course, so sure. We order the mixed soy garlic chicken and the spicy ddukbokki because the couple next to us has it and it looks amazing. We also ordered the Kimchi Coleslaw which I've heard is a must-order, but they were out so we replaced with the scallion pancake instead. If you find yourself in Nolita, be sure to stop in to Little Cupcake Bakeshop to grab yourself a sweet treat. We picked up a Coconut Cloud cupcake and found it to be just as delightful as Billy's or Magnolia's offerings, but without a line! Finding ourselves in the Nolita area, I was excited to finally bring The Mr to Rice to Riches. Considering rice pudding is one of his favorite desserts, this trip was long past due. I just love everything about this place. The flavors! The toppings! The funky, reusable containers! The snarky signs everywhere you look! Or as The Mr put it "Who knew you could have so much fun with rice pudding??" Even if you don't think you like rice pudding, I'd encourage you to try it out (unless you don't like the pudding consistency of course, that will still be a problem). This is a great place to bring an out-of-town visitor too. And if they really enjoy it, there is a kiosk built in to the wall where you can send rice pudding anywhere in the USA! We took advantage of our half day at work by heading over to Lombardi's to see how America's First Pizzeria stacks up. We thought we were being clever by going around 3pm in between the dinner and lunch crowds, but we were still facing a 20 minute wait (really not that bad though). After we took a quick stroll around the block, our wait time was over and we were led downstairs to our table. It didn't take us long to decide on what to order- our classic half plain/half pepperoni margarita pie.